Fig. 4 Overview of the supramolecular phases and the derived structural models for 2HTPTBP on Cu(111) at different coverages (a–c: relatively low coverage; d–f: medium coverage; g–i: monolayer coverage; all the STM images were measured at RT). The red and yellow ovals indicate the individual molecules with different orientations. The intermolecular T-type-like interactions and p–p stacking interactions in the structural models are highlighted by green lines and black parallel lines, respectively. The van der Waals interactions between the phenyl groups of two neighbouring molecules are marked by green dashed lines. Tunnelling parameters: (a) U = 1.0 V, I = 30 pA; (b) U = 1.6 V, I = 30 pA; (d, e, g and h) U = 1.1 V, I = 30 pA. The adsorption behaviour of 2H-5,10,15,20-tetraphenyltetrabenzoporphyrin (2HTPTBP) on different metal surfaces, i.e., Ag(111), Cu(111), Cu(110), and Cu(110)–(2 ? 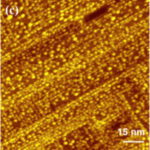 1)O was investigated by scanning tunnelling microscopy at room temperature. The adsorption of 2HTPTBP on Ag(111) leads to the formation of a well- ordered two-dimensional (2D) island structure due to the mutual stabilization through the intermolecular p–p stacking and T-type-like interactions of phenyl and benzene substituents of neighboring molecules. For 2HTPTBP on Cu(111), the formed 2D supramolecular structures exhibit a coverage-dependent behaviour, which can be understood from the interplay of molecule–substrate and molecule–molecule interactions. 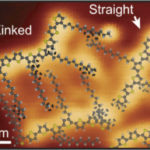 In contrast, on Cu(110) the 2HTPTBP molecules form dispersed one-dimensional (1D) molecular chains along the [11%0] direction of the substrate due to relatively strong attractive molecule– substrate interactions. Furthermore, we demonstrate that the reconstruction of the Cu(110) surface by oxygen atoms yields a change in dimensionality of the resulting nanostructures from 1D on Cu(110) to 2D on (2 ? 1) oxygen-reconstructed Cu(110), induced by a decreased molecule–substrate interaction combined with attractive molecule–molecule interactions. This comprehensive study on these prototypical systems enables us to deepen the understanding of the particular role of the substrate concerning the adsorption behavior of organic molecules on metal surfaces and thus to tweak the ordering in functional molecular architectures. Figure 3. STM images after exposing Rh(111) to AO: (A) θO,total = 6.4 ML at Tdep = 700 K; (B) θO,total = 2.9 ML at Tdep = 350 K followed by 600 s anneal at 700 K; (C) θO,total = 0.9 ML at Tdep = 350 K followed by 600 s anneal at 700 K. Insets are LEED patterns (62 eV) taken after deposition. STM images were obtained at 30 K and conditions were (L to R) (A) 100 mV, 137 pA; 181 mV, 170 pA; 140 mV, 153 pA; (B) 50 mV, 400 pA; 70 mV, 410 pA; 50 mV, 400 pA; (C) 20 mV, 200 pA; 20 mV, 150 pA; 20 mV, 150 pA. Recent studies have shown the importance of oxide surfaces in heterogeneously catalyzed reactions. 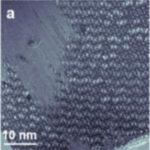 Because of the difficulties in reproducibly preparing oxidized metal surfaces, it is often unclear what species are thermodynamically stable and what factors effect the oxide formation process. 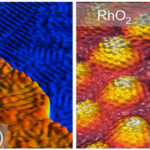 In this work, we show that the thermodynamically stable phases on Rh(111) after exposure to atomic oxygen are the (2×1)- O adlayer and the trilayer surface oxide, RhO2. Formation of RhO2 was facilitated by surface defects and elevated concentrations of dissolved O atoms in the subsurface region. As the concentration of subsurface O atoms decreased, the coverage of RhO2 decreased so that only the (2×1)- O adlayer was present on the surface. The importance of subsurface oxygen species in RhO2 formation and stability indicates a complex relationship between surface structure and subsurface oxygen concentration.